Ready Player One / Warner Bros.
“Ready Player One,” the latest film from director Steven Spielberg, is the story of Wade Watts, a kid from Columbus, Ohio. He lives in a futuristic world where everyone – the young, old, poor, and rich – spends the vast majority of their time in virtual reality (VR), to avoid the dystopian real world where poverty and despair run rampant as a result of global warming and overpopulation. 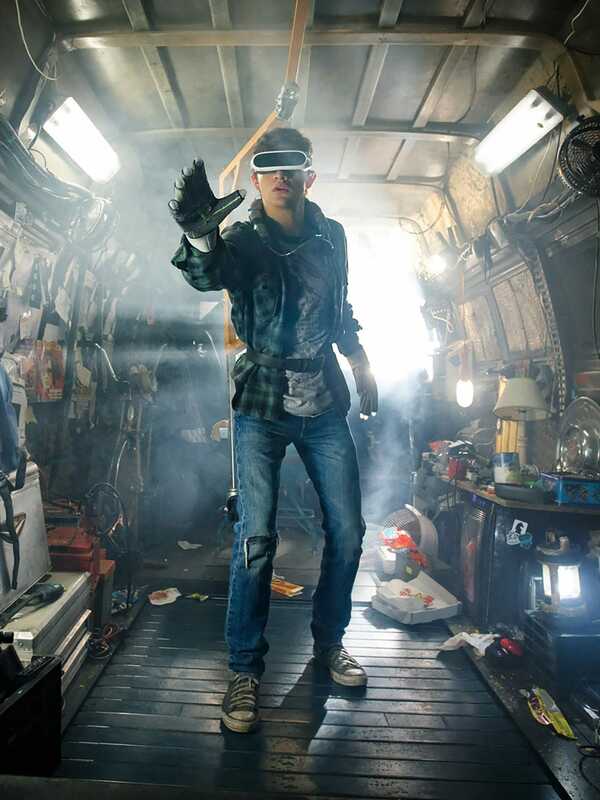 Based on the 2011 novel by Ernest Cline, “Ready Player One” paints a rather pessimistic view of society’s growing dependence on technology, but also depicts the fantastical possibilities presented by VR and other futuristic technologies. Given the many realistic-looking and fantastical gadgets and technologies featured in “Ready Player One,” we took a closer look at some of the most exciting technologies featured in the film to see how they compare with innovation happening in the real world. 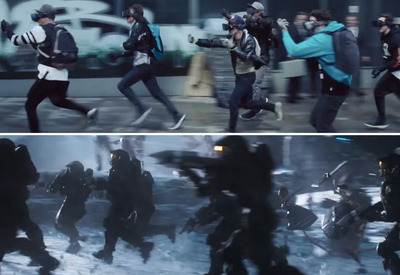 Ready Player OneIn ‘Ready Player One,’ VR-headset-wearing players run through the streets with controllers in hand, but in the Oasis, they look like characters from the game ‘Halo’ running into battle. “Ready Player One” depicts a VR experience that is so seamlessly immersive, there are no physical barriers between the user and the virtual objects and environment. In the movie, players are able to touch, pick up, and hold onto things – and even people – in VR that are not really there in real life. They can sit in virtual chairs and lean on virtual surfaces without falling down in the real world. While this is the ideal future of VR technology and it looks great on screen, complete immersion is really difficult to achieve in real life, mostly because it’s just really impractical. For example, many players are seen running through real 3D space, out in public, which is obviously a massive safety hazard. The VOIDGuests experience The VOID, an immersive multiplayer VR adventure. Current VR systems can be incredibly immersive if a physical play area is custom-made to match the virtual one. 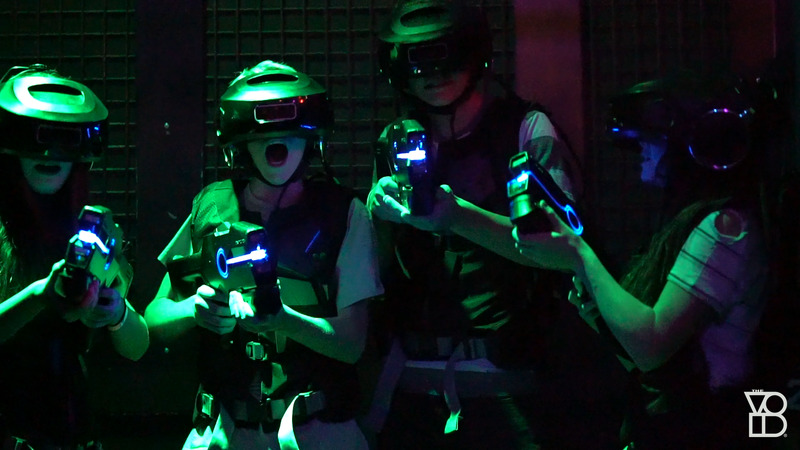 All over the world, virtual reality theme parks like The Void are starting to open to the public. The Void lets small groups of people to enter the same physical space for a virtual adventure. People are let loose in a physical maze created to perfectly align with the world they see in their headsets. So, when a player sees a wall in VR, they can reach out and touch it because there is also a real wall there in real life. These VR-enhanced obstacle courses are heavily padded and specially equipped to be safe for the players, who can be ducking for cover or shooting invisible monsters at any given point. These experiences are very immersive, intense and – at least, so far – are really difficult to replicate with commercially available VR equipment in one’s home, as “Ready Player One” depicts. 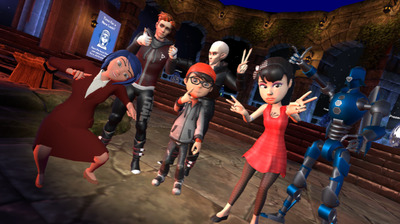 Much of the film takes place in The Oasis, a massive multiplayer online game and virtual society in which everyone has chosen to escape their real-world problems. Wade Watts describes The Oasis as a place where anything is possible, and is only limited by the user’s imagination. There are several popular video games, many even created to be experienced in VR, that offer players a similarly massive and social environment in which they can make friends, play games, and explore virtual worlds. One of the most exciting social VR experiences is VRChat, a free multiplayer online meeting place you can download via Steam or the VRChat website. 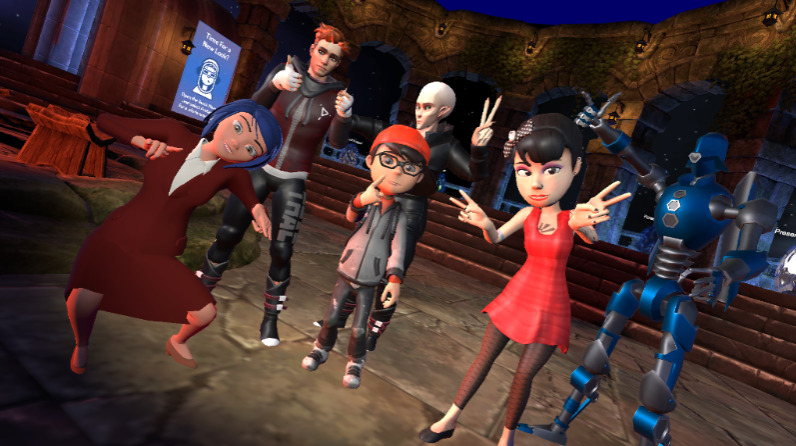 VRChat is very similar to the Oasis, in that you’ll be entering a world where cartoon characters walk through the streets. There are ample environments to explore and adventure to be had, and there is a thriving community and culture that many have said is unlike anything they have experienced in real life. Ready Player OneWhen Artemis, Wade’s love interest in the story, places her hands on his chest in The Oasis, Wade can feel the touch in real life, thanks to his haptics suit. 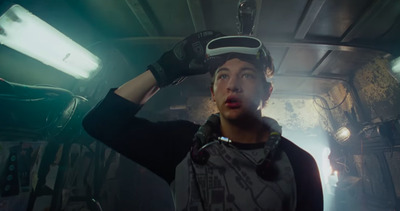 One of the ways “Ready Player One” depicts touch through VR is via heat-sensitive haptics suits, which apply pressure on the player’s body wherever an object or other person in VR touches their avatar. They look a lot like a spandex super hero’s suit, in that they are smooth, light and tight-fitting. Real Life: Real haptics suits! TeslasuitA man and a woman model the Teslasuit. Turns out, the real world has been working on haptic technology, or wearable tech that lets you feel and touch virtual objects, for a long time – and is finally starting to get good at it. The Teslasuit (which is in no way affiliated with Tesla, the electric car company) offers “a wide range of sensations across your whole body whether the soft touch of warm rain, a heavy impact or even the freezing cold,” according to their website. The Teslasuits do not come cheap, and are not ready to be sent to stores just yet, but you can sign up to get on the waiting list to preorder one on their website. There is also a wide variety of haptics gloves being developed and tested in the real world today, which experts predict are likely to replace controllers after a few more iterations of the top-shelf VR headsets like the HTC Vive. Ready Player OneWade Watts from ‘Ready Player One’ stands on an omni-directional treadmill. In “Ready Player One,” there are a few different ways that players manage to walk and run through virtual reality, while staying in place in the real world. Wade uses an omni-directional treadmill that he controls with his feet, which allows him to travel in 360 degrees, at any speed he likes. 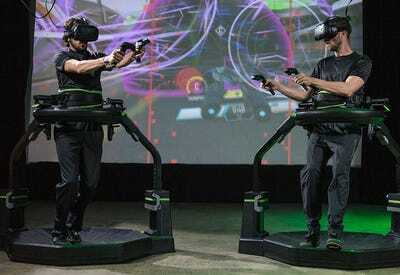 VirtuixTwo players demonstrate the Omni, by Virtuix. There are a handful of companies working on gaming and omni-directional treadmills, but they have largely failed to take off as consumer products, mostly because they take up a huge amount of space and are expensive to purchase and power. Instead, they are most often found in specialised arcades, like this one in Melbourne, Australia. One of the most popular treadmills for VR is called the Omni, made by Virtuix. These are actually really different from the one depicted in “Ready Player One,” because they use arms and a harness to prevent the player from walking off the side or falling over, making them look like a baby walker for adults. Instead of walking on a belt like the ones used in traditional treadmills, gamers using the Omni put a special sole on their shoes that allow them to slip along the stationary, slightly tilted base of the walker, which allows for true 360-degree locomotion. Ready Player OneWade, aka Parzival, collects virtual coins in his DeLorean. In the dystopian future in which the “Ready Player One” is set, virtual coins collected in The Oasis have replaced real money, both on and offline. Players collect coins by winning games and fighting other players, but can lose coins by being defeated or dying in the game, which results in “zero-ing out,” aka losing all your money. This means losing in the game has real-world financial consequences, and has contributed to the rise of poverty in the “Ready Player One” universe. Before coming to the big screen, “Ready Player One” was first a novel, written by Ernest Cline and originally released in 2011. At the time, cryptocurrency was still in its very early stages, and no one could have predicted the rise in value and popularity of bitcoin that would ultimately disrupt American and global economics the way that it, and other cryptocurrencies, have today.